A UC San Diego study of the impact of music training on the brain and behavioral development in children has been awarded a grant of nearly $20,000 by the Grammy Foundation. 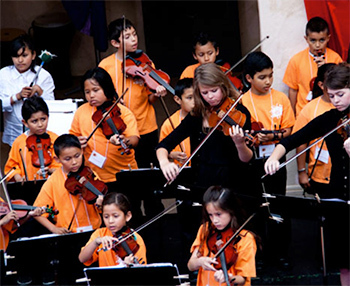 The San Diego Youth Symphony’s Community Opus program works in partnership with the UC San Diego SIMPHONY project to better understand how music helps young minds develop and grow. 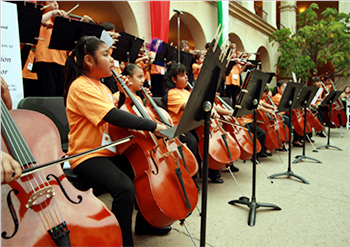 Photos courtesy of San Diego Youth Symphony. SIMPHONY, short for Studying the Impact Music Practice Has On Neurodevelopment in Youth, is a collaboration among researchers at UC San Diego's Center for Human Development and the Institute for Neural Computation. The study includes not only a non-music-learning control group, said Iversen, but also another control group of students studying martial arts, which can help pinpoint any benefits due to musical training as opposed to more general enrichment activities. The Grammy Foundation award of nearly $20,000 will enable the project to retain an older cohort of music students within the study, and will support their testing for two additional years. Jernigan, the project’s lead neuro-imaging researcher, is a leader in the field of child neuro-development; Iversen and co-investigator Aniruddh Patel (now at Tufts University) are noted for their research into music cognition and the cognitive relationship between music and language. The Grammy Foundation Grant Program, funded by the Recording Academy, provides annual funding to organizations and individuals to advance the archiving and preservation of the recorded sound heritage of the Americas, as well as research projects related to the impact of music on the human condition. Organized Research Units – including the Institute for Neural Computation and the Center for Human Development – make up a significant portion of the university’s billion-dollar research enterprise, and contribute to UC San Diego’s pioneering interdisciplinary and multidisciplinary leadership.